The Sunday match of a Barford CC Tour is always a considerable challenge for most of the players! 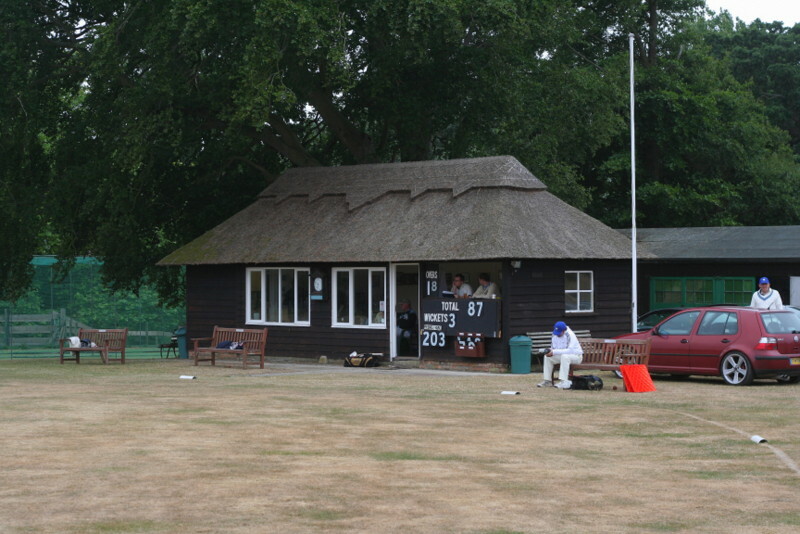 – but the prospect of once again visiting the lovely ground which is home to the friendly Pylewell Park CC is a good antidote to the various self inflicted legacies of the previous two matches and nights on tour. It was originally planned that one of our two “virgin tourists”, James, would captain today but his broken finger prevented him from taking up the challenge on the field so I was very pleased to see him with us on tour and grateful to take on board his thoughts about captaining the game. On Sunday morning we only had one recruitment issue (to cover Fish who was unable for personal reasons to join us) and a mild concern about Richard Johnson’s colour! Simon got the short straw when I woke him from his post early morning beach walk slumbers and he said “yes” before he realised what he had done! This was a great relief to Mike who now had clearance to “do the slab” with Erdsy! Thanks to some pre tour cyber due diligence by Mike, who had spotted that the Pylewell CC website hosts the Walhampton Arms as a local real ale and food pub and with some help from the “i-whatever’s” to find a post code for the SAT NAV’s, we all arrived in good time for lunch. (As a pub I don’t think this was a patch on the Kings Head Inn where we went last year but it was easy to find and probably more important, to park). Pre-match thoughts from James – We have three wicket keepers and I think we will need the legs and throwing arms of Chris and Phil in the field, so Sandy should keep. A time game is preferred and ideally we should bat second. The ground looked very dry with a short cut outfield. This year the pitch, which had already been used, was at the far end of the square which was a relief. The wind would be behind the fielder throwing from the longest boundary and hopefully we would not have a repeat of last year, when on occasions it took three attempts to relay the ball back to the pitch!! The Pylewell skipper was very keen to play a time game because he had a lot of youngsters in his side and felt it was good experience for them to play this format. I lost the toss but persuaded him to bat first. Barford opened the bowling with the in form pair of Griffin and Henderson who both bowled very tightly, Ben taking a couple of wickets and Paul 7-2-15-0 very unlucky not to do the same. The only down side during this excellent start was that Richard was certainly not quite with us and early in the game, following a chase for the ball (with a 60+ player), he vanished off the field! Great! This is a big ground with a very fast outfield and now we only have 10 men. Hawkins and Jolly continued the attack with Simon 6-1-25-0 unlucky to miss a difficult caught and bowled and Tim 5-0-23-0 bowling a very mean spell without the benefit of the wind helping his in-swing. Quietly and effortlessly during this spell of the game Master Mann (13 yrs) was demonstrating his prodigious batting talent. After drinks two bowling changes brought results with Timms 4-0-24-1 removing the stubborn Royan (39) by inducing a skyer and Johnstone, with the help of an excellent catch by Morris, depriving Mann (47) of a 50 (I’m sure he will get many in the future). Significantly, Wodge (responsible for the famous quote from last year “the dog has got the ball” as we tried to retrieve the ball from an adjacent field) had arrived at the crease! Paul J continued his excellent spell with lots of variation and Jones 3-1-32-1 got the satisfaction of removing his opposing skipper but also got some long handle from the belligerent six-hitter. Ben returned to tighten things up and Johnstone 8-1-53-3 finally got due reward by bowling Wodge (78). When an over excited young player ran himself out (Brown – more of him later) and Ben 8-0-29-3 immediately bowled the new batsman for a duck the Pylewell umpire turned to me and said “great, everyone gets to bat”. In our scorebook the final total isn’t recorded but for the purposes of this report batsmen are credited with 199 and bowlers conceded 201. So let’s settle on 201-9 declared at tea and that also means that Sandy didn’t let through any byes. Brilliant! This was a good Barford effort with only 10 on the field. Tea was a delicious array of tempting sandwiches and cakes, sufficiently good to see the re-appearance of Richard, who I was now reminded by our resident expert umpire (thanks Pete for standing throughout the match) could not bat before 7. The Barford reply got off to an excellent start with O’Reilly batting carefully and Henderson continuing his golden Tour form. During the eighth over O’Reilly (9) was caught but Johnstone complimented Paul’s aggression with some graceful strokes and good running to take the score to 55 when Henderson (33) holed out to wide mid off. Griffin, also in good Tour form, settled quickly and at drinks Barford had reached 80 for 2 and were well set. Then Griffin (27) was tucked up by an in swinging Yorker from Brown and the game was turned, much earlier than I was expecting, to Barford trying to remember how to bat for a draw in a time game! What happened next I am not really able to report? At the fall of Ben’s wicket we had Jolly, Timms and Morris padded up and at that point Hawkins, Johnson and Jones decided en-block that this was the time for us all to get padded up. The changing room at Pylewell has no view of the playing area and much to our amazement as we went through our fight with kit bags etc Jolly (0) and Timms (0) returned! The scorebook shows that in one over the score advanced by one (from the squiggle I think it’s a wide) and Brown had taken three wickets, all bowled. Barford 105-6! In the next 5 overs the score progressed to 120 with some resistance from Morris (4) and Hawkins (0) before both were bowled by Royan. Enter a less than well Johnson who played a great 21 ball block and leave over the next nine overs to help Peirson, who is at his best in these situations, to take the score to 134 and more importantly into the last over of the game. Brown was recalled for the final over and with his second ball trapped Johnson (0) lbw leaving Jones to navigate the last four balls. Greeted by Sandy with the helpful advice “he’s swinging it in” the first ball was a long hop outside off stump, easily left, and the next one wasn’t! – Somewhere the “very late” had been missed out. Jones bowled (0) and Sandy (21 no) was stranded. Pylewell had won with two balls to go and my enduring memory will be the sight of an elated 13 year old running towards me with both arms high in the air. His final figures were 7-0-26-6 but in his last two overs he took 5 wickets for 1 run (and that was a wide). Later I signed the ball on behalf of BCC and donated it to him – it was his first “6 for” and like the batting of Mann I doubt it will be his last. We repaired to the Pavilion to share a drink with our friendly hosts who thought it had been a great match played in the correct spirit and we mutually agreed not to light the BBQ because by now – it was freezing cold.